Hurricane Harvey is the fist natural disaster to occur during the Trump administration and the first real test of his leadership capability. Well he failed that test miserably! He went to Texas, but he didn't go anywhere near the devastation. He didn't get wet or dirty. Melania even wore a pair of stilettos, which I am sure the poor victims of the hurricane could never be able to afford, even if they wanted to look so slutty! Trump was criticized for not putting his around a victim of the hurricane and hugging him/her showing that he cared. How could he? He didn't even go near any of the victims! He didn't even mention the victims or first responders! He didn't see any of the destruction! What did he do? He talked about himself! He talked about pardoning the great American patriot, bigot and racist, Sheriff Arpaio! He talked about his rally in Missouri and how he won that state in the election! And he wore that white baseball hat everywhere! 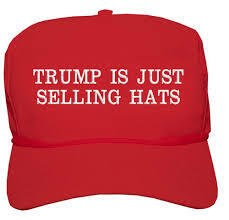 It just happens that the hat can be purchased on his website! By the way they're not made in America, but in China! So much for his bringing jobs back to the US! Trump failed as a leader. He showed absolutely no empathy or concern for the victims and their families nor for the first responders risking their lives to save others. He did not see the Texans, of all religions, all ethnicities and all gender identification, the very people he is trying to destroy, helping each other in this time of tragedy. He only say a chance to make a profit on the backs of all those suffering! He failed as a president, a leader and a human being!